Colts Camp Report – Who is Standing Out? With almost a full week of camp under their belts, the Indianapolis Colts are starting to look like a team again and not just a collection of new/young transplanted players. As expected, Andrew Luck already looks comfortable with a horseshoe on his head completing over 70% of his throws with limited turnovers early in camp. But beyond the obvious, who is standing out so far? With Colts Camp set to begin this weekend, a new era of Indianapolis Colts football is set to begin. Gone are mainstays such as Peyton Manning, Jeff Saturday, Joseph Addai, Dallas Clark, and Gary Brackett. In to replace them are a large group of rookies and young vets looking to carve a name for themselves in this league. While the media has pretty well written this season off for the Colts and put us as the worst team, I still see a lot of promise and believe 8-8 is a possibility, 6-10 is realistic, and 4-12 is the worst case scenario. All of this depends on how some guys perform in camp. Here are the top 5 players to watch as Colts camp begins. Indianapolis Colts head coach Chuck Pagano banned the word “rebuilding” from everyone’s vocabulary. “Redecorating” is the new word around town. Maybe revamping is another good word for it. Whatever the case the colts are totally doing just that. Coach Pagano and defensive coordinator Greg Manusky both come from a 3-4 and are finally implicating that system after playing a soft Tampa 2 since the Tony Dungy days started. Im very excited to get away from it and play more physical defense. Pat Angerer will benefit the most from the switch in my opinion. He will be able to play more up on the ball and plug the seams. Last year he had to drop back into coverage way to much. He obviously shown freak talent since getting playing time. It’s exciting to think about Dwight Freeney and Robert Mathis as defensive/linebackers. Both will be playing new roles that they have never seen. I see the change for the good and both players can really really shine in the hybrid scheme. Coach Pagano has a lot of work to do, don’t get me wrong. The secondary is a major concern with Jarraud Powers is the only proven guy we have. If he stays healthy this could be a really good year for him I seem to think that Chuck is ready for the challenge. Colts fans are ready for a more in your face defense that’s for sure. There comes a time in every young career where a player must face some sort of adversity. For Indianapolis Colts WR Donnie Avery, that adversity came early, and unlike most players, it just would not leave him alone. This story is not about his failures however, it is about what he is about to do in his 5th professional season. As a lifelong Colts fan, I do have a great appreciation for the teams that you built for us in the late 90’s and the abundance of success that we enjoyed under your management throughout the early 2000’s. Because of these teams, we have a beautiful Super Bowl Championship banner flying high above Lucas Oil Stadium and we just had the opportunity to host our cities first Super Bowl. This offseason, the Indianapolis Colts have gone through their first full scale roster purge since the mid-90’s. There are a lot of roster holes that that have to be filled before training camp. Despite some quality free agent signings, there are still plenty of gaping holes to fill. True to Colts form, they plan to utilize the draft to fill these holes and begin to build a new dynasty. 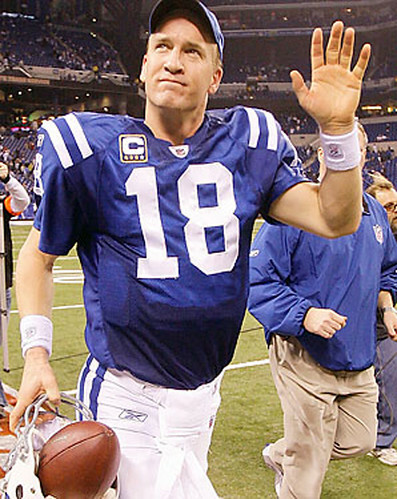 I do not care what Colts owner Jim Irsay or QB Peyton Manning have to say, neither of them is telling the whole truth. There has been much made of the “war of word” between Irsay and Manning over the last week. Tweet fight has become the new catch phrase of the day. Only people are making a lot out of nothing because what Irsay and Manning are “fighting” about has little to do with the truth of the situation. Neither of them is telling the truth about where it is the Colts and Peyton Manning truly are. But I will…or what I BELIEVE to be the truth.